Ocean City, Maryland – (January 30, 2018): It is a bittersweet farewell for the Ocean City Finance Department, as longtime Finance Director, Martha Bennett, and payroll manager, Yetive King, retire this month. With a combination of nearly six decades of service to the Town of Ocean City, Bennett and King will both work their final day on January 31, 2018. Bennett started her career with the city’s finance department in 1984, later getting promoted to Assistant Director of Finance in 1988 and Finance Administrator in 1989. Along with her vital role overseeing the daily operations of the finance department, Bennett managed the town’s capital projects, bond sales and severed on 10 labor negotiating teams, preparing various significant economic, utility rate and budgetary studies over her career. She is a member of the Government Finance Officers Association and the Maryland Association of Certified Public Accountants. She served on the State Treasurers Advisory Board for the Maryland Local Government Investment Pool for 24 years and served on the board of the Ocean City Fire Department Length of Service Awards Program for 18 years. With a Bachelor’s Degree in Accounting from Salisbury University and a Master’s in Public Administration from Wilmington College, Bennett valued education and strived for excellence in her position and her department. She received certifications in public accounting, governmental financial management and chartered global management. In addition, Bennett has been the recipient of the Certificate of Achievement for Financial Reporting from the Government Finance Officers Association of the United States and Canada for 30 years. “While I look forward to enjoying my retirement, I will miss being a part of the Finance Department, and working for the Town of Ocean City,” Bennett commented. “I hope that the friendships I have developed here will last well into the future. I appreciate the many opportunities I have had working for the Town and have grown personally and professionally. It is a privilege to work with so many dedicated employees and officials over the years. Bennett intends to travel to the western National Parks this year, studying horticulture, enjoying gardening and beekeeping at her home in Berlin. She also looks forward to spending extra time with her daughter, son in-law and grandchildren in South Carolina. King started her career shortly after Bennett, beginning as an accountant in 1986 and being promoted to payroll manager in 1990. 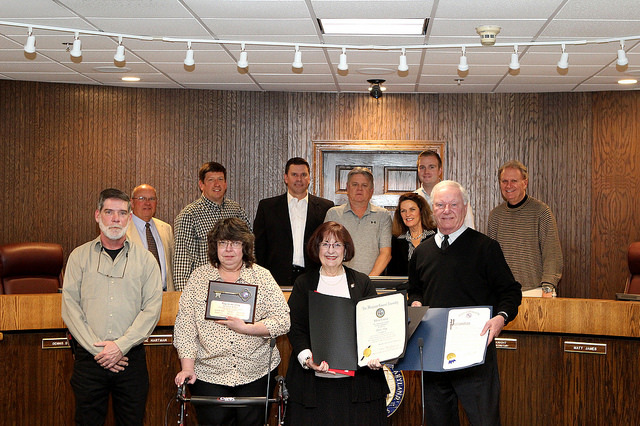 Along with processing biweekly payroll, she used her expertise in Excel to compile numerous worksheets and graphs for the annual production of the town’s Comprehensive Annual Financial Report (CAFR), which has been awarded the Government Finance Officers Association award for excellence in financial reporting since 1988. Her dedication to her job was evident in her work and her attendance, as she processed more than 750 payrolls and only missed two in her 28 year career as payroll manager. “I have had the honor and privilege to work with Yetive for 30 years,” Bennett stated. “She knew every aspect of her job and was brilliant at coding. She has an incredible mind and because of her high skill level she was behind the scenes assisting and improving our department in many ways. She was so dedicated to her job and employees. While we congratulate her on her retirement, she will be dearly missed by all Town of Ocean City employees. Upon retiring, King plans to stay on the Eastern Shore, residing in Willards with her husband. In addition, she hopes to spend more time with her daughter Betsy and four grandchildren, as well as enjoy hobbies such reading, and raising specialty chickens and turkeys. Photos from yesterday’s Retirement Recognition. Martha Bennett – Finance Director & Yetive King – Payroll Manager.